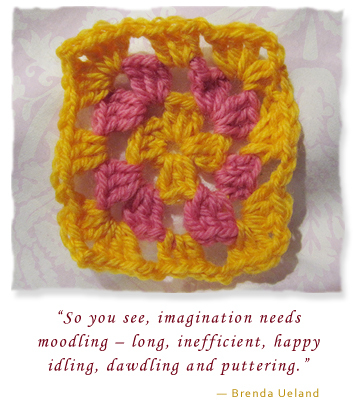 I have been enjoying some long, happy idling with crochet. Really good for the soul. This is my first attempt at using two colours in a granny square. Loving the result. I am seeing visions of colourful blankets dancing in my head. After a long time with little to no creative inspiration, I am enjoying this time of creation and new ideas. And after reading the above quote by Brenda Ueland, I want to find copies of her two books. She sounds like she was a very wise, very creative lady. As she wrote, I think my inspiration is coming from allowing myself time to putter, to do what my heart desires without over-thinking the end results. – A related post (on creativity) that I found most inspirational, by Pip from Meet Me At Mike’s. Do read, it really is worth it. I love your two colour granny square. I will have to make time to sit down, look through my crochet (children’s book) the one I referred you and learn. I am also studying Certificate 4 in Finance (Bookkeeping) I was studying Certificate 3 in Nail Technology but I was not that interested so I swapped. My twin sister has done the TAFE Library Technician course and also Library Degree. She works at Burwood nursing library. They have TAFE students from Ultimo do work experience at her library. The Book Depository is great I order books all the time from the website. As a matter of fact I ordered three just today. It is soo much cheaper and you normally get the books within one to two weeks. The bird makes funny huffing sounds when Lolly the cat is near. I’m finding the granny squares very addicting! Whenever I have a spare moment I want to make a new one. The nursing library sounds like a very interesting place to work, never been all that interested in public library work myself. Do you study on campus or at home? I’m considering doing a photography course later this year, not sure yet.